Millions of people have disabilities that affect how they use the internet. Taking account of web accessibility means that these people can use, experience and contribute to the internet in a meaningful way that does not discriminate against their disability. We have a moral obligation to provide equal access and equal opportunity to everyone that wishes to access education at Aston. The legislation states that Aston must make reasonable adjustment to make content accessible. It can be prudent to include an access statement that states your intentions to provide a module that is accessible to all. It should include what to do if one of your students finds any of the content inaccessible for any reason. Fonts should be an ‘easy to read’, sans-serif style and at least 12pt size. Below are a number of base principles to consider to improve the accessibility and usability of your Blackboard course. Consistency is extremely important in making a course usable. It reduces cognitive overload, improves communication, exhibits professionalism and increases user efficiency, all of which contribute to improving the user experience. Structure – follow the Aston template to build your course. 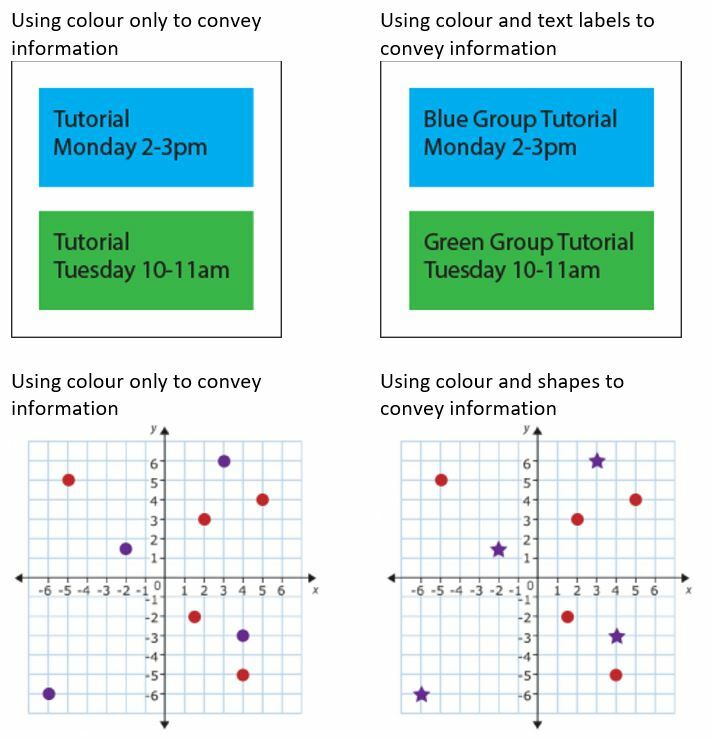 This will ensure students find similar resources in similar places across all their courses. Navigation – group similar items together in folders rather than a long list down the screen. Use of language – avoid slang terms and ensure items are referred to with the same name. For example, Aston university log on details could be called ‘Aston login’, ‘Aston log in’, ‘Aston username and password’. Formatting – use the same styles and headings in your content and ensure you update them on content imported from another source. File types – convert all possible files to PDF. Visual cues – ensure these are always identical to allow users to instantly recognise them. Use descriptive link text so all users know what they are clicking on before selecting the link. Many screen reader users will list all the links on a page, if all links use the text ‘click here’, the screen reader can only create a list of links without context consisting of ‘Click Here’, ‘Click Here’, ‘Click Here’. Use a sans serif font such as Ariel or Verdana, this is easier to read than a serif font such as Times New Roman. The Blackboard default text is “size 3”, however, you are encouraged to make text on a page “size 4” so it is more legible. Do not overuse bold when emphasizing text. If everything is emphasized then nothing is emphasized. Using italics can be problematic for those with dyslexia. It is advisable not use underline as another form of emphasis as this is often used to signify a web link. It can confuse users into thinking that they can click the underlined text. Do not copy and paste text from Word as this may bring unwanted formatting information that your page. If you need to copy and paste text, first copy your text into Notepad, then copy and paste from Notepad into Blackboard. This will strip out the unwanted Word formatting. Divide your pages semantically with headings to create the page outline. This is helpful for users who use screen readers to access Blackboard as the headings will be used by a screen reader to navigate the page. It also has the added benefit of allowing visual users to easily scan the page. In Blackboard you should use the Format drop-down menu to select a suitable subheading format for any headings that you insert in the rich text editor. When creating Word documents to be uploaded to Blackboard follow the same advice as above and create headings within the document, they can be selected from the style menu. You should export Word documents as a PDF with settings to preserve the document structure and create a heading tree. This will not only make the document more accessible but will ensure consistency of layout across different devices. Long paragraphs and justified text can be problematic for those with dyslexia. Break up them up using bullet points and left align formatting. Audio and video content may be problematic for students with hearing or visual impairment or those with unreliable internet access. Providing text transcripts can overcome these hurdles. If you are creating a video or audio content yourself it is advisable to work from a script. This will improve the production quality of your content and provide you with a ready-made transcript. All non text-based content such as images and charts should have concise descriptions that describe the contents of the media. 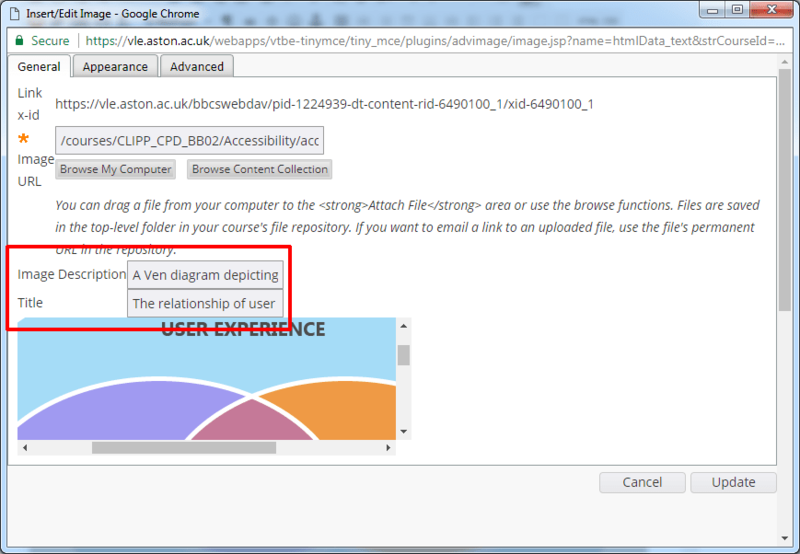 This can be added in Blackboard when you embed an image in a page. In many cases writing alt-text can be quite difficult. See this guide by WebAIM about writing alt-text for help.